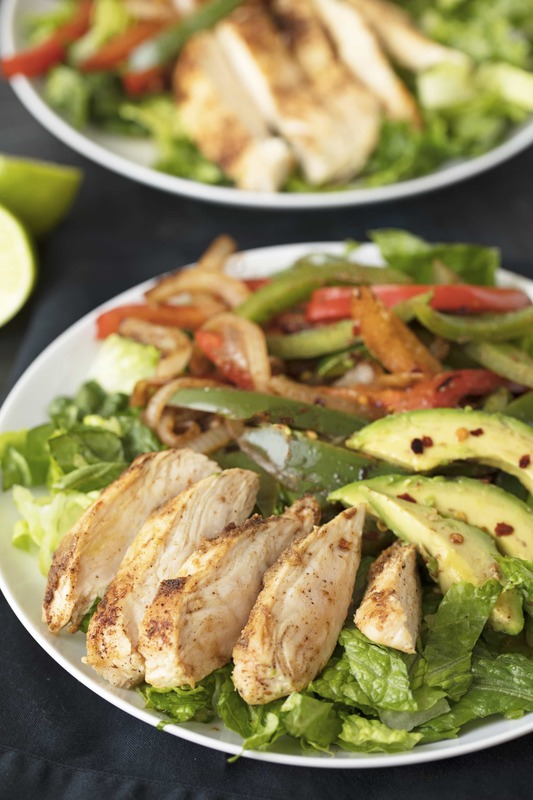 Skinny Chicken Fajita Salad is a recipe you’ll use over and over again. This salad is ready in under 15 minute making it the perfect quick healthy lunch or dinner option. If you are trying to eat healthier then you need this salad in your life. 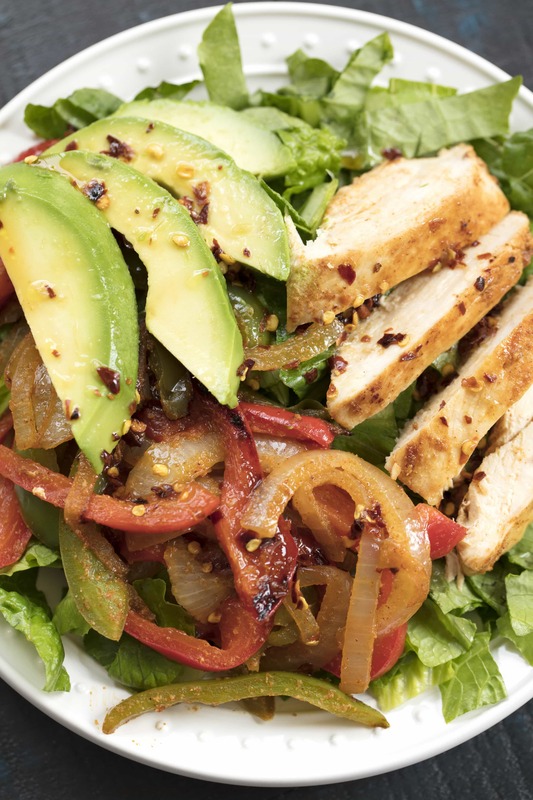 It’s super quick to throw together and that is important when it comes to eating healthy. You need food fast, not fast food. 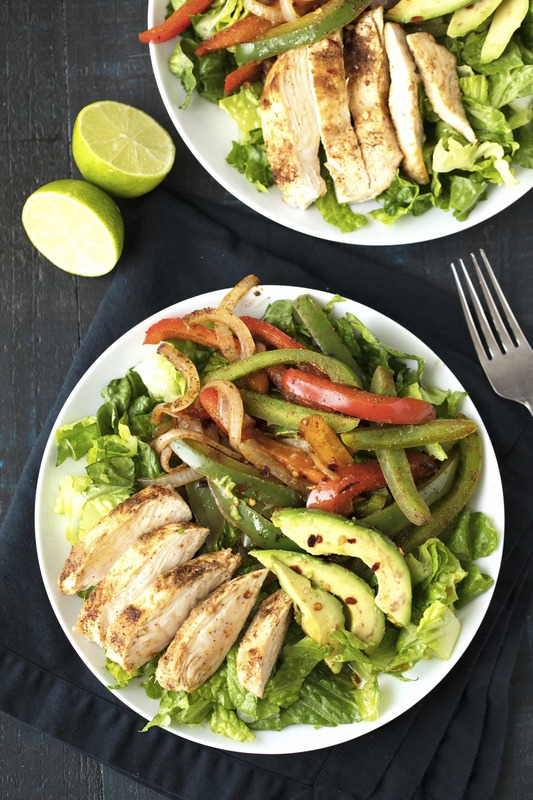 This salad is everything you love about fajitas, in a healthier form. Healthy eating is all about finding a balance of healthier habits in your life. I promise, it’s okay to indulge now again, but you can also learn that a delicious salad can be an indulgence as well. I even have a beef version from back in 2014 if you’d like to check it out. It uses steak for a hearty salad experience. The dressing for this salad is low fat and low sugar. I give you the option of doubling the sugar in the recipe which is good for people who are new to this kind of eating. You can also use sugar substitutes in place of the brown sugar. Honey and stevia are great options. Watch the video to see just how easy it is to make this recipe. I always include a video with my recipes so that visual learners can follow along too. You can check out all of my cooking videos on my YouTube Channel. You should check them out! 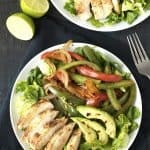 Skinny Chicken Fajita Salad is a recipe you'll use over and over again. This salad is ready in under 15 minute making it the perfect quick healthy lunch or dinner option. Sprinkle the whole skillet with salt, chili powder, cumin, and garlic powder. This recipe first appeared on The Stay At Home Chef on November 2, 2012. My husband refers drumdticks and they were perfect. I made a balsamic herb with a little honey dressing. Delightful, pared with a Blanco Seleccion Product of Spain. All the deliciousness of fajita without guilt, didn’t change a thing!!! Could anyone tell me why I cannot print out this recipe, I’ve tried many times! I’m not sure why you are having problems. I just checked and there’s no problems on the site. Do you have a popup blocker by chance? I don’t provide caloric information on my website. There are plenty of online calculators that are happy to give you an estimate. How many does this feed? It looks so good that I could eat it all by myself. As the recipe indicates, it feeds 1 to 2 people. (1 large portion, or 2 normal size portions). I made this for dinner tonight! It is very good! Will definitely make it again! I did use honey in place of the brown sugar in the dressing. This looks delicious. It will be tonight’s dinner!